This article is about Derbyshire (disambiguation). 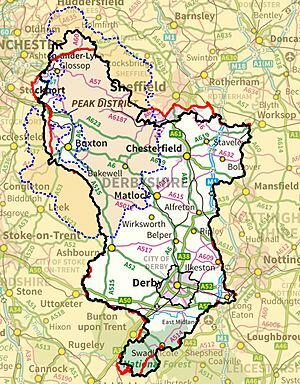 For other uses, see Derbyshire (disambiguation). 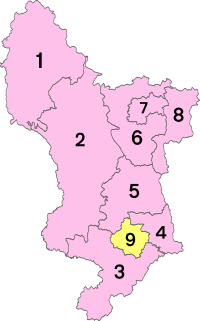 Derbyshire ( i/ˈdɑːrbᵻʃər/ or /ˈdɑːrbɪʃɪər/; abbreviated Derbys. or Derbs.) 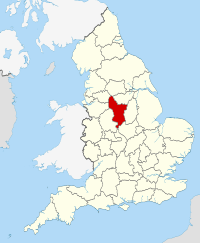 is a county in the East Midlands of England. A substantial portion of the Peak District National Park lies within Derbyshire, containing the southern extremity of the Pennine range of hills which extend into the north of the county. The county contains part of the National Forest, and borders on Greater Manchester to the northwest, West Yorkshire to the north, South Yorkshire to the northeast, Nottinghamshire to the east, Leicestershire to the southeast, Staffordshire to the west and southwest and Cheshire also to the west. Kinder Scout, at 636 metres (2,087 ft), is the highest point in the county, whilst Trent Meadows, where the River Trent leaves Derbyshire, is its lowest point at 27 metres (89 ft). :1 The River Derwent is the county's longest river at 66 miles (106 km), and runs roughly north to south through the county. 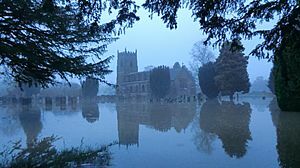 In 2003 the Ordnance Survey placed Church Flatts Farm at Coton in the Elms (near Swadlincote) as the furthest point from the sea in Great Britain. Because of its central location in England, and its altitude range from 27 metres in the south to 636 metres in the north :1, Derbyshire contains many species at the edge of their UK distribution ranges. Some species with a predominantly northern British distribution are at the southern limit of their range, whilst others with a more southern distribution are at their northern limit in Derbyshire. As climate change progresses, a number of sensitive species are now being seen to be either expanding or contracting their range as a result :314. For the purposes of protecting and recording the county's most important habitats, Derbyshire has been split into two regions, each with its own Biodiversity Action Plan (BAP), based around National Character Areas. The Peak District BAP includes all of Derbyshire's uplands of the Dark Peak, South-West Peak and White Peak, including area of limestone beyond the national park boundary. The remaining areas are monitored and recorded in the Lowland Derbyshire Biodiversity Action Plan, which subdivides the landscape into eight smaller Action Areas. Since 2002 the county flower for Derbyshire has been Jacob's-ladder (Polemonium caeruleum), a relatively rare species, and very characteristic of certain limestone dales in the White Peak. :187 Derbyshire is known to have contained 1,919 separate taxa of vascular plants (including species, hybrids and micro-species) since modern recording began, :409 of which 1,133 are known to be either native or archaeophyte, the remainder being non-native species. These comprise 336 established species, 433 casuals and 17 unassigned. It is known that 34 species of plants once native here have been lost from Derbyshire (i.e. become locally extinct) since modern plant recording began in the 17th century. :410 Derbyshire contains two endemic vascular plants, found nowhere else in the world: Rubus durescens, occurring in central Derbyshire, :89 and Derby hawkweed (Hieracium naviense), still known only from Winnats Pass. 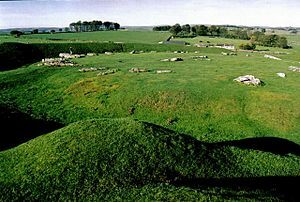 :263 One endemic species of moss, Derbyshire Feather Moss, occurs in one small 3-metre patch in just one Derbyshire limestone dale, its sole world location intentionally kept confidential. The distribution and status of vascular plants in Derbyshire have been recorded over the last 120 years in a series of four major botanical works, each by different authors between 1889 and 2015, but all entitled The Flora of Derbyshire. Plant recording is mainly undertaken locally by volunteers from the Derbyshire Flora Group, :406 and by staff at Derbyshire Wildlife Trust and the Peak District National Park. As at 2015, Derbyshire contains 304 vascular plant species now designate as either of international, national or local conservation concern because of their rarity or recent declines, and are collectively listed as Derbyshire Red Data plants. :418 Work on recording and publishing a bryophyte flora for Derbyshire is still ongoing; as at 2012 a total of 518 bryophyte species had been recorded for the county. 14 Eckington 11,152 (2001) North East Derbyshire Figure is for Eckington civil parish, which includes Renishaw, Spinkhill, Marsh Lane and Ridgeway. Wingfield Manor: 1980s BBC TV series of The Chronicles of Narnia. Chesterfield: The twisted spire of Church of St Mary and All Saints, Chesterfield was made famous by its use in the opening credits of the 1966–71 ecclesiastical BBC TV sitcom All Gas and Gaiters, featuring Derek Nimmo. Derbyshire Facts for Kids. Kiddle Encyclopedia.